Seriously, look back two years. Just what kind of hardware was Apple selling in April 1999? 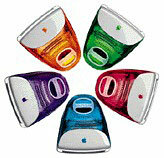 The 266 MHz fruit-flavored Rev C iMac. That was 266 MHz on a paltry 66 MHz system bus, an insignificant 32 MB of RAM, a pathetically small 6 GB hard drive, a barely adequate 6 MB of video memory, and a run-of-the-mill 24x CD-ROM drive. You can replace that $1,200 iMac with today’s “faster” 500 MHz iMac that has a 100 MHz system bus (50% faster! ), 64 MB of RAM (twice as much), a 20 GB hard drive (over 3x larger), a whopping 16 MB of video memory, and burns CDs – all for the same $1,200. And you can probably unload your pathetic old iMac in the outdated fruity colors for $600 on eBay. The fastest Mac you could buy was the Power Mac G3/400 – you remember, the Blue & White tower with 128 MB of memory, a 12 GB hard drive, CD-ROM, and a 66 MHz PCI video card with 16 MB of video RAM. That baby cost $3,000 – the same as today’s non-DVD Power Mac G4/733, which comes with 256 MB of memory, a 60 GB hard drive, CD-RW, and a smoking AGP 4x Nvidia GeForce 2 MX or ATI Radeon video card with 32 MB of video RAM. Even bus speed has improved from 100 MHz to 133 MHz. And for $500 more, you can make your own DVDs. 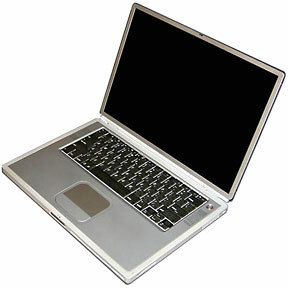 The hottest PowerBook was a 300 MHz WallStreet with a pedestrian 1024 x 768 display, CD-ROM, and the curb weight of a Volkswagen Beetle (okay, just 7.8 pounds). With 64 MB of RAM, a 192 MB memory ceiling, and a 8 GB hard drive, that $3,500 model can’t compare with the TiBook at 500 MHz for the same price. The new PB G4 has a 100 MHz system bus (50% faster), 500 MHz CPU (67% faster), a G4 processor (not even available in April 1999), 256 MB of RAM (expandable to one gigabyte! ), a DVD drive, and yet the whole thing is just 1″ thick and tips the scales at 5.3 pounds. There wasn’t even an iBook, let alone the stunningly attractive Cube. Moore’s Law states that the number of transistors in a given area will double every 18 to 24 months. What that means in the real world is that memory chips double in capacity every 18 months or so and CPUs pretty much double their performance on the same schedule. Likewise, although not related to Moore’s Law, we see the same kind of progress with hard drives. Imagine that you bought a new Suburban in 1999 that could just hit 55 MPH on the open road, guzzled gas at 10 miles per gallon, and cost you $30,000. If cars followed Moore’s Law, the 2001 Suburban would top 120 MPH, get around 25 MPG, and cost you $20,000. Wouldn’t you feel hopelessly outclassed if all the 2000 cars were zipping past you at 85-90 MPH and the 2001s screaming past at over twice your speed? Back to computers – that’s why you need to buy new every two. The improvements in CPU speed, memory, computer bus speed, hard drive capacity, and video performance almost makes your computer obsolete within a year. Two years is really pushing things, especially with new technologies (DVD burners, for instance) coming onto the market that no 1999 G3 could support. Buying new every two isn’t just good for your self esteem; it’s also good for Apple Computer and puts more used Macs on the market for the poor slobs who can’t afford to upgrade any time CPU speeds double. Your purchase benefits the broader Mac community – how can you afford not to?